On 1 July, on the eve of Belarus’s official Independence day, Alexander Lukashenka highlighted the connection between Belarusians and the Grand Duchy of Lithuania. This was the first official statement to allude to the historical roots of a sovereign and independent Belarusian state. Since the beginning of the conflict in Ukraine, the Belarusian authorities have started employing rhetoric which differs starkly from the usual official nationhood discourse. The Belarusian authorities continue balancing between the West and Russia while simultaneously trying to mitigate confrontation with the opposition within the country. The process of national revival began to speed up after the Declaration of State Independence of Belarus on 27 July 1991. This process was initiated by nationalising elites in the second half of the 1980s. During this period, national symbols (such as the white-red-white flag and the Pahonia coat of arms) acquired official status. Information about the deep historical roots of Belarusian statehood also started to appear in history books. However, everything changed when Lukashenka came to power in 1994. One year after his inauguration, he drafted a referendum which would lead to the formal recognition of Soviet-era state symbols and make Russian the second official language (de facto the only working language). Belarus was well on its way to political rapprochement with Russia. History books were once again rewritten, but this time emphasis was placed on the roots of Belarusian independence in the early days of the USSR; the national ideology was to be based on Soviet values. What’s more, the collapse of the USSR was treated by both history books and Lukashenka himself as ‘the greatest catastrophe’, and its restoration in one form or another was to be seen as a restoration of historical justice. According to official rhetoric, proponents of a national revival in Belarus were now portrayed as ‘nationalists’, who aimed to undermine Belarusian statehood and the Union State of Belarus and Russia for the sake of better relations with the West. According to some political scientists, the rhetoric of Lukashenka in the late 1990s can be linked to his political ambitions to replace the faltering Yeltsin in the Kremlin and become leader of a kind of updated version of the Soviet Union. Things began to change when Putin came to power in Russia. Lukashenka quickly realised that his former Kremlin ambitions were now impossible: he thus focused on strengthening his power in Belarus. At the same time, Minsk’s strong economic and political dependence on Moscow forced the Belarusian authorities to keep on with the pro-Russian rhetoric – including a Russia-friendly interpretation of Belarusian history. Thus, dates such as 9 May – Soviet Victory Day in the Second World War, and 7 November, which commemorates the October Revolution of 1917 (and still remains a national holiday in Belarus) were seen as the most important historical events. What changed after the Ukraine conflict? The status quo only began changing starting with the war in Ukraine. The Kremlin’s rhetorical use of the ‘Restoration of the Russian World’ as an excuse to occupy Crimea and invade a large part of the Donbas frightened the Belarusian authorities. They suddenly realised that Moscow could very easily take political power in Belarus as well. Resistance from Belarusian society – Russified and disoriented in matters of national identity – would be minimal. Following the invasion of Crimea, the authorities increasingly began to allude to Belarusian sovereignty, the importance of respecting the Belarusian language, and the nation’s historical roots. Thus, on the eve of the official Independence Day in 2014, a few months after the occupation of Crimea, Lukashenka, who usually uses only Russian language, gave a speech in Belarusian, referring to Belarusian independence from both Russia and the West. 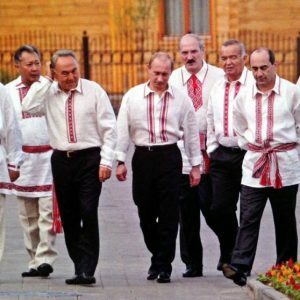 According to Belta, in February 2017 Lukashenka stated that history books should discuss the true roots of the Belarusian nation, and not just the Soviet version. Moreover, since the start of the Ukraine conflict, the level of conflict between Lukashenka and the Belarusian opposition has decreased. This is partially due to a change in Lukashenka’s rhetoric: he continually emphasises the sovereignty of the Belarusian state. Russia’s aggression in the region has resulted in a kind of compromise between the opposition and the authorities. First of all, the opposition have recognised Lukashenka’s international influence and ceased to bring up issues which had once been fundamental. The authorities, in turn, are maintaining a policy of soft Belarusisation and revising their discourse on Belarusian sovereignty. In September 2016, the Belarusian president noted that he always encouraged Belarusian officials to speak Belarusian, writes Nasha Niva. Later, during a May 2017 meeting with Minsk school children, Lukashenka emphasised that Belarusian schools would benefit from more use of the Belarusian language. Thus, representatives of the Belarusian Republican Youth Union (BRSM) have started to appear in ‘vyshyvanka’ (shirts featuring the national ornament), which had previously been considered taboo in official circles. Besides the Vyshyvanka Festival, BRSM also organised a campaign to present small vyshyvankas to new-born children. Certain clubs in Minsk have started hosting ‘traditional-style’ parties, at which ‘vyshyvanka’ plays an important role. At some informal meetings, even Lukashenka himself has donned the national pattern. The apogee of this new policy of turning away from Russia was the arrest of several journalists working for Regnum, a Russian website which promotes the revival of the Russian Empire. They were suspected of inciting ethnic hatred – a charge which carries long prison terms. Another sign of the authorities’ re-allignment was the presence of the Minister of Foreign Affairs, Uladzimir Makei, at the World Congress of Belarusians on July 15. The event is organised by the World Association of Belarusians, traditional opponents of the current regime. Russian propagandists were quick to interpret these signals from Minsk as ‘the machinations of the West’ and local nationalists, who are plotting to organise a Belarusian ‘Maidan’. Incensed by the contacts between Lukashenka and Ukrainian President Poroshenko, Russian nationalists began labelling Lukashenka a ‘traitor’ to the ‘Russian World’. Rethinking statehood: imitation or real change in official rhetoric? Belarusian authorities have apparently changed their position towards Belarusian nationhood. However, phenomena such as the Festival of Vyshyvanka, organised by the pro-governmental Youth Union BRSM, the shift of emphasis in history textbooks, and pro-Belarusian statements by officials could be just another attempt to hang on to power. The aim of these signals seems to be mitigating confrontation with the opposition in the context of possible annexation by Russia. Belarus continues to be at the mercy of the Russian information space, which has significantly more influence on the world-view of Belarusians than the state propaganda machine. In order to reduce the influence of Russian propaganda and the concept of the ‘Russian World’ on Belarusian society, the Belarusian authorities could take several measures. One would be to stop suppressing independent civil society and media. However, the authorities continue to treat their own citizens as the enemy, perceiving activists as a threat to their power. Therefore, Belarus continues to balance between loyalty to the Union with Russia and the idea of national independence. On 15 – 16 July 2017, Minsk hosted the VII Congress of the Belarusians of the World, gathering over 300 participants. This year’s event was remarkably diverse, featuring Belarusian foreign minister Uladzimir Makei and even the former detainees in the White Legion case. Belarusian Foreign Ministry started displaying interest to the diaspora Belarusians relatively recently. It still struggles to find effective tools to engage the diaspora, as the latter remains critical and distrustful towards the official political regime. At the same time, young generation of Belarusian expats appears to be emerging as a new dynamic force, extensively using social networks to improve communication and organisation. In March 2017, diaspora activists from all over the world launched a solidarity campaign BY_Help in response to the state brutality during peaceful spring demonstrations. The congress of the world’s Belarusians takes place every four years, concentrating on the current issues of relations between Belarus and its diaspora. The organiser, the World Association of Belarusians Baćkaŭščyna (Homeland), has been maintaining contacts to the Belarusian diaspora since 1990 and serves as a roof organisation for the Belarusians abroad. According to Baćkaŭščyna’s most recent estimates, around 3.5 million Belarusians reside in 73 different countries. Obtaining more accurate numbers is not possible, as not every migrant chooses to inform Belarusian authorities of his or her decision to leave. Moreover, registration at Belarusian embassies and consulates abroad is voluntary and does not offer any perks for those who take the time to do so. This results in inaccurate official statistics, misrepresenting the actual numbers of Belarusians abroad. For instance, according to Belstat, 1,046 persons emigrated to Canada during 2000 – 2010. 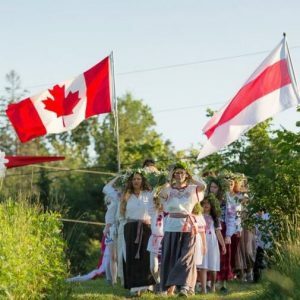 However, available Canadian statistics for the same period indicate the higher number of about 5,700 persons, with an average of 500 Belarusians emigrating to Canada annually. Many Belarusians who move abroad and obtain the citizenship from another state often choose the option of keeping their Belarusian passports if possible. However, they are motivated by the ease of travelling and visiting their relatives back in Belarus rather than by patriotic feelings. According to the president of “Baćkaŭščyna” Alena Makoŭskaja, weak feelings of national identity along with a lack of sentiments towards the homeland lead to quick assimilation of Belarusians permanently residing abroad. For instance, the number of people identifying as Belarusians in Russia went down from 1.2 million to 0.5 million just over the recent two decades. In 2014, the Law On Belarusians Living Abroad came into effect, yet so far it failed to offer any incentives to Belarusians living abroad, similar to those introduced in Poland within the framework of Pole’s Card program. Belarus recognises neither dual citizenship nor foreign education credentials, thus discouraging many Belarusian emigrants and Western-educated Belarusians to return and contribute to the economy at home. Since 2016, the Belarusian state started another round of review of its relationship with diaspora, wishing to appropriate the latter’s potential to serve as a soft power tool in the foreign policy. Acknowledging diversity of opinions existing about current political regime, Belarusian foreign minister Uladzimir Makei appealed in his speech at the Congress to unity of all Belarusians, pointing out external and internal challenges to the independence of the state. Makei’s appearance was overshadowed by an unpleasant incident on the eve of the Congress. The archbishop of the Belarusian Autocephalous Orthodox Church and the member of the Council of the World Association of Belarusians Sviataslau Lohin was denied entry to Belarus at the border crossing in Homel region. Apparently, the local border guards have not yet been informed of the new priorities in foreign policy, as the very next day a call from the Belarusian Foreign Ministry was enough to solve the issue, allowing the archbishop to continue his journey. Not everyone at the Congress was convinced by the new conciliatory tone of the foreign minister. Valiancina Šaučenka, representing Belarusian Canadian Alliance, noted the continuous marginalisation of the Belarusian language and a lack of democratic reforms. Canadian Belarusians refused to maintain any contacts to the state institutions, declaring their support to civil society initiatives and those working towards democratic changes in Belarus. The potential of diaspora solidarity with the regime’s opponents came to the foreground during spring 2017, when the state cracked down against the peaceful demonstrations. BY_Help was born on 15 March, following the brutal detentions after the “March of Non-Parasites” and grew into full-scale solidarity campaign after the crackdown on 25 March. BY_Help activists collected $ 55,000 in donations from Belarusians all over the world to support the arrested protesters and their families, provide legal assistance, and help in paying the fines imposed by the Belarusian courts for the detained as well as for independent journalists, who covered the protests and suffered from persecution. Apart from its initial goals, BY_Help campaign also demonstrated that Belarusian diaspora is quickly outgrowing the outdated ways of communication and organisation. As Kryscina Šyjanok who administers the Facebook group for Belarusians in the Czech Republic, pointed out, the new generation of Belarusian expats prefers to stay in touch through social networks, which open up new ways to engage larger groups of Belarusians or people of Belarusian origins residing abroad. Social networks help to create more inclusive environment for communication and organisation of activities, so that even those who did not show permanent interest to their former homeland, feel more confident to join and contribute. Finally, openness contributes to cultural exchange and dialogue, presenting Belarus to the world not as the notorious “last dictatorship” but through its people. Beyond fostering informal contacts, the new generation of Belarusian diaspora uses its expertise to demystify Belarus. The Ostrogorski Centre is the first think-tank uniting professionals and academics of Belarusian origins, who were trained at Western universities. Its projects, including Belarus Digest, focus on promoting better understanding of Belarus. Starting from 2016, the Centre organises Ostrogorski Forum – an annual conference on foreign policy and security, aiming to bring together independent and pro-government analysts and experts. However, Belarusian authorities still lack a comprehensive program outlining the long-term strategy of relationship with its diaspora. In order to establish an effective connection, the state should start taking diaspora Belarusians seriously and offer them more serious incentives than cooperation in cultural projects.